The weather around here has been so crazy. It goes from cold to mild in a day. One day I am freezing and the next day it is 60 degrees out. It has given me a bad case of spring fever. Today I translated that into my outfit. 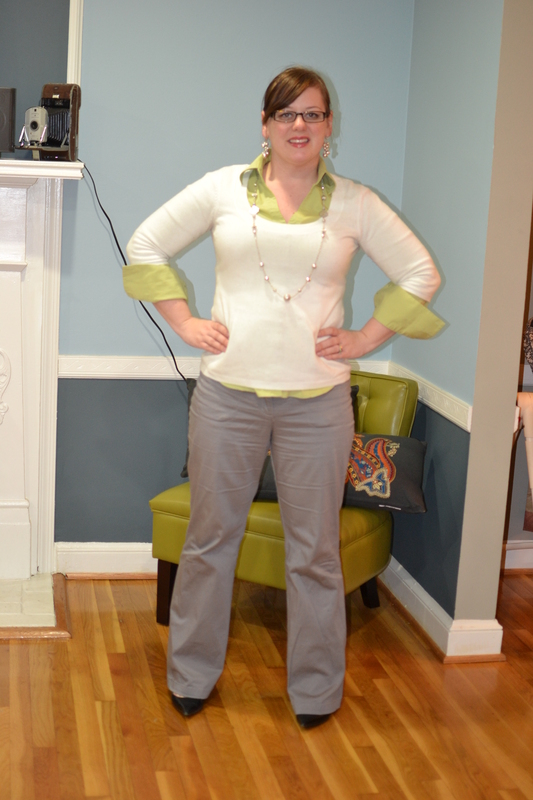 I love how this green complements the shade of blue-gray that these pants have. 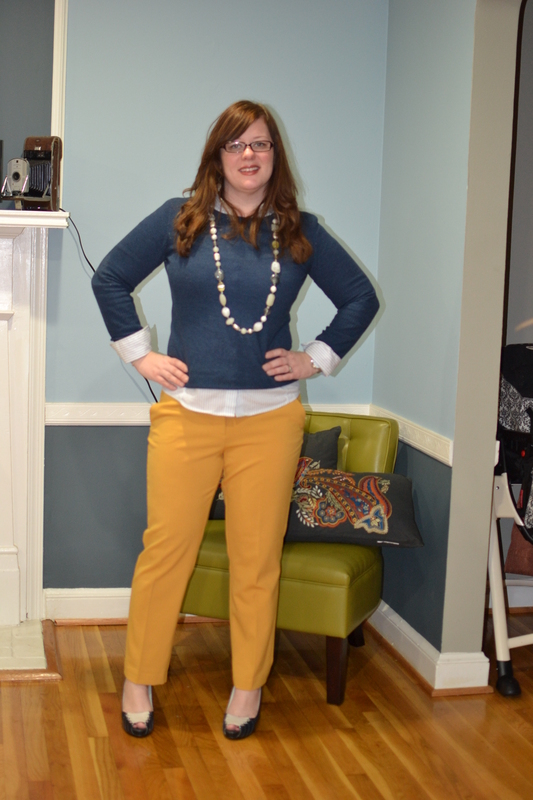 I also like breaking it up and making it more springlike with this white sweater. What do you think, did I channel my spring fever? 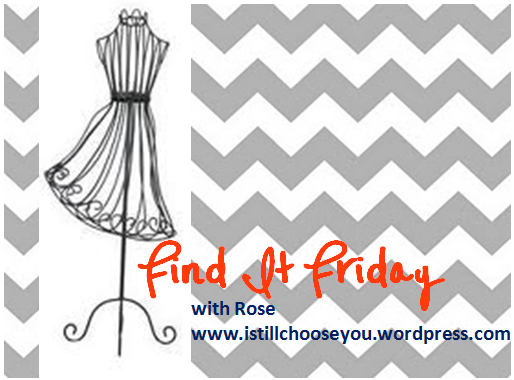 Don’t forget to join me on Friday for Find it Friday! I didn’t do any outfit planning this weekend, so when I woke up today I had no clue what I might want to wear. I ended up grabbing this brown dress from Target. 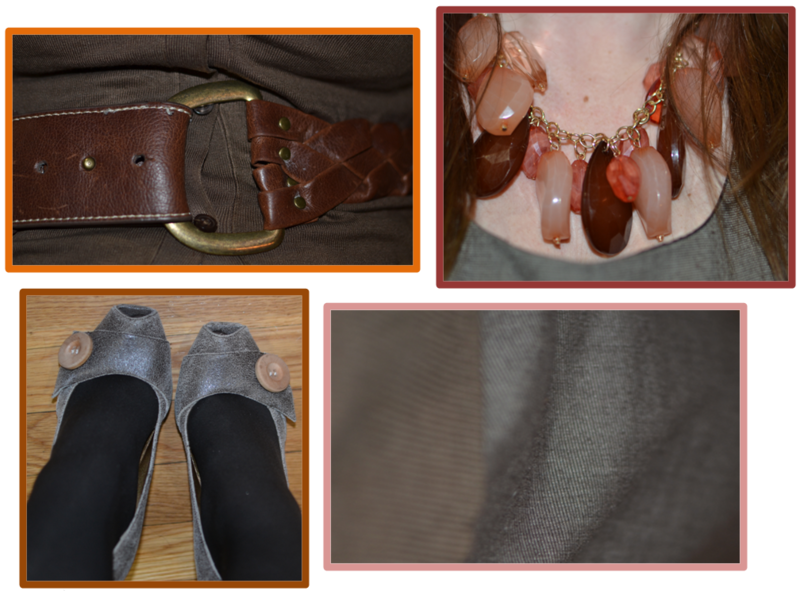 I thought about pairing it with my leopard wedges and a burnt orange cardi, but then decided to go all brown expect for the big pop of jewelry (although this necklace certainly has brown tones). My new glasses finally came in! 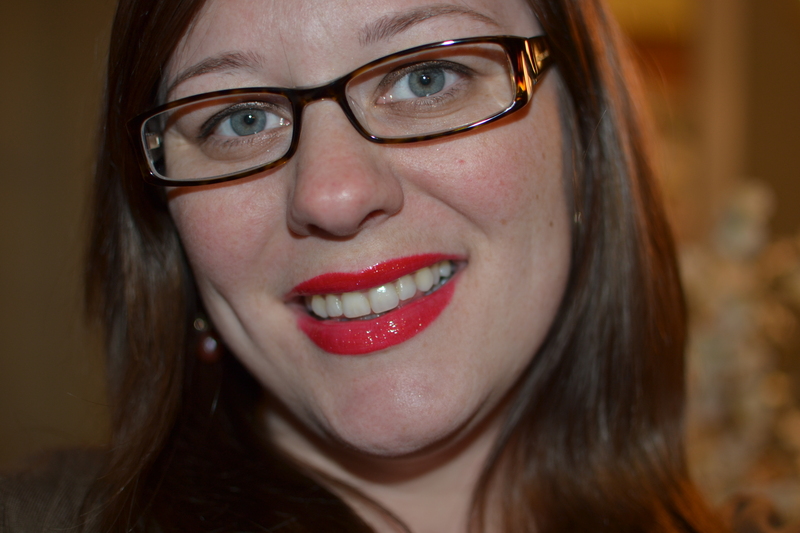 I am so excited that I can finally see clearly again – I also tried a bold lipstick today. 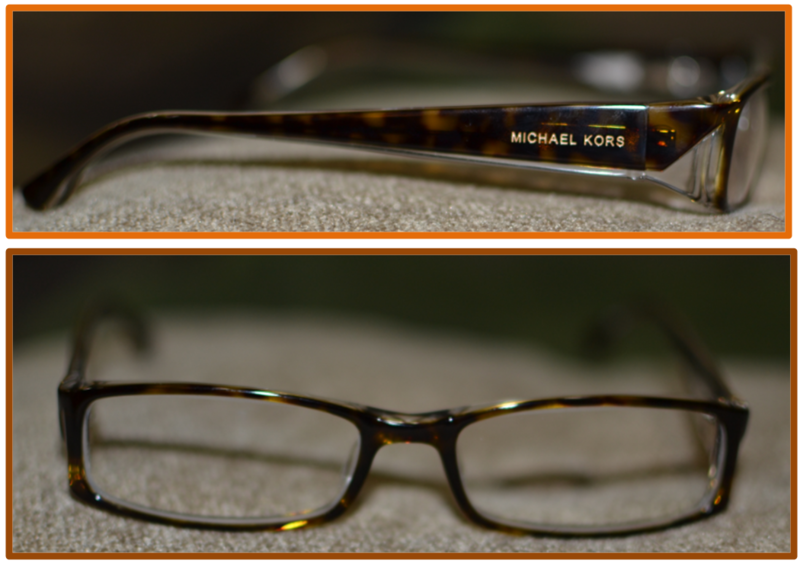 My glasses are Michael Kors. I love all the little details of them. They have a great rectangle shape that flatters my face and then they have these clear triangles on the side. They are also very comfortable. What do you think, do you like the new glasses? Do you like the bold lips? So the lovely Amber Lena joined us this week. 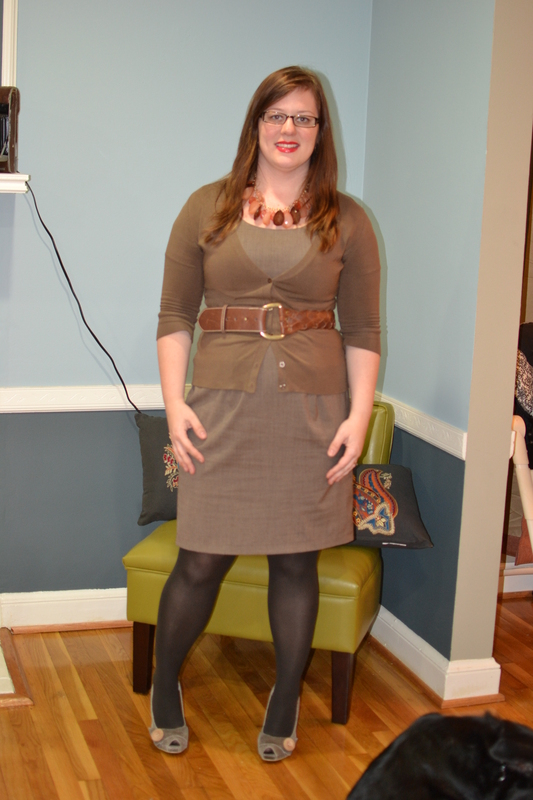 Also joining us this week is Shay from My Confidence and Me. 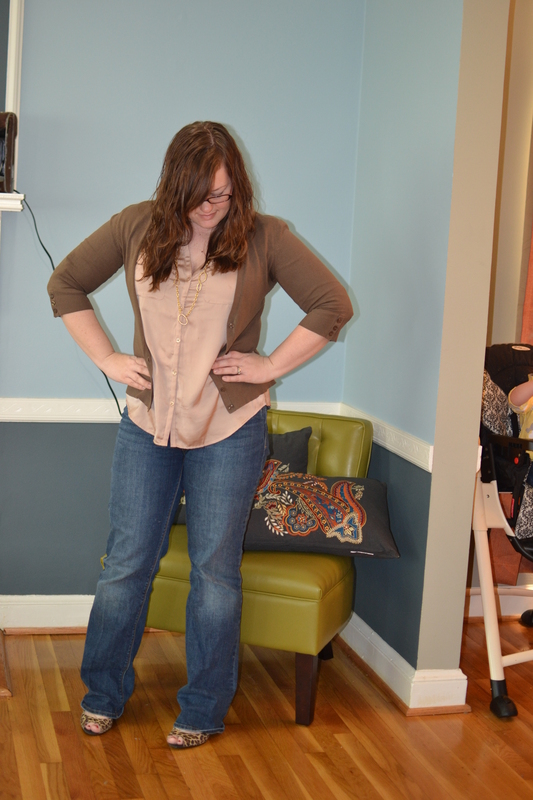 Shay said this – My found item is this blue cropped jacket! It got pushed to the back of my closet (with a lot of my other jackets), but because it doesn’t have a collar, I couldn’t see it and I forgot all about it! They both look great and I think their items should stay. 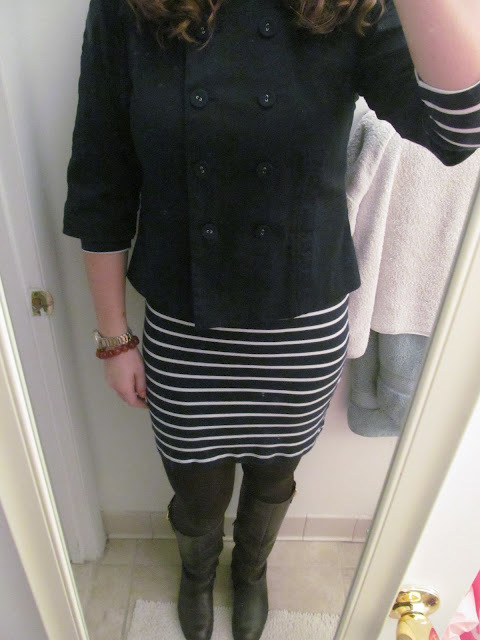 As a reminder – here is my outfit. Sorry for the late post. I had a very busy day, followed by book club! Today is FIND it FRIDAY! Read all about it here and let me know if you are joining in! So, I have had this dress for a long time and used to wear it frequently. I stopped wearing it when I became pregnant. Then I stayed home from work for a year and it just never made its way back into the rotation. I really do like it and I love the color. I guess that I struggle with wearing it in different ways. How else would you style this dress? Want to join me in Find It Friday tomorrow? 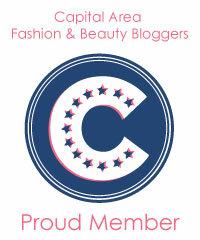 Grab this here button and join me!! I am looking into the link party for future posts if this draws in a crowd. Do not always come to be. 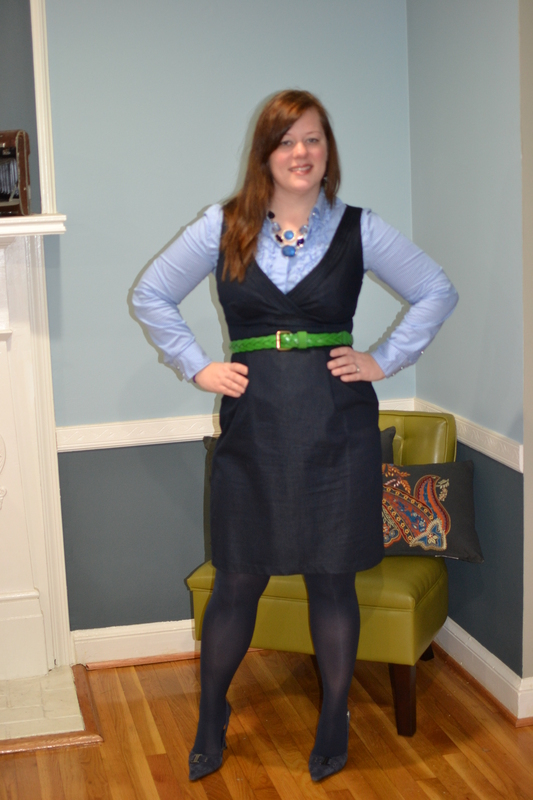 I didn’t post yesterday because I basically wore a mix of these two outfits. I wore the suit and the polka dot shirt. 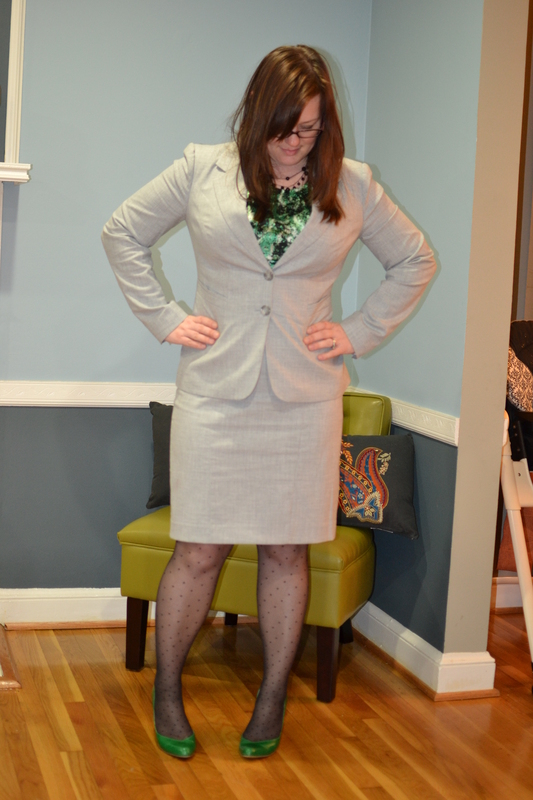 I also wore the polka dot tights and black shoes. I didn’t show it off because I also worked late last night and was very tired when I got home. I had planned to wear something different today, but was very tired when I woke up and just went with something easy. Two things that I have learned from this outfit. I need to remember to always iron in the crease of these pants. 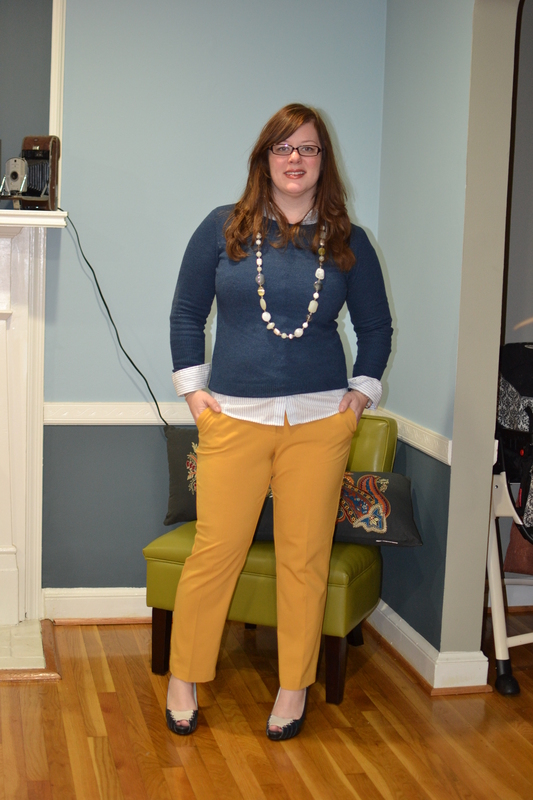 I also need to wear these pants with at least a little bit of a heel. 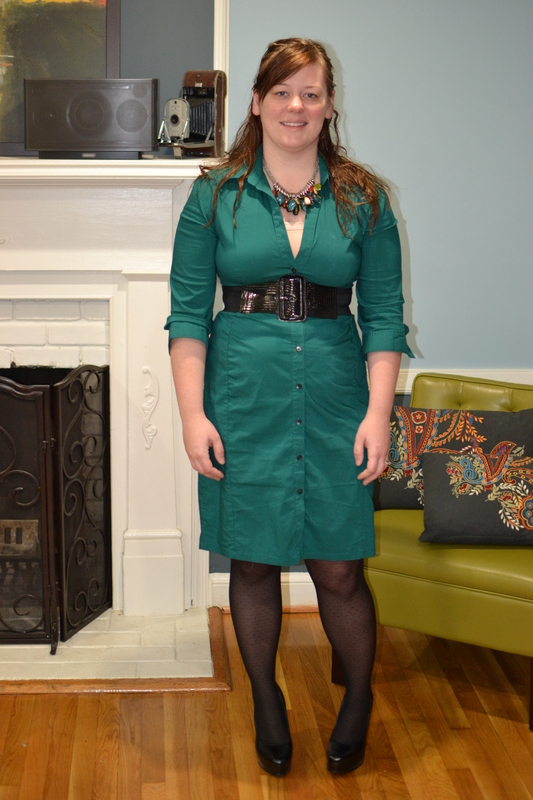 I am not sure that this outfit translates as well in pictures as it did in person… but I am going with it. 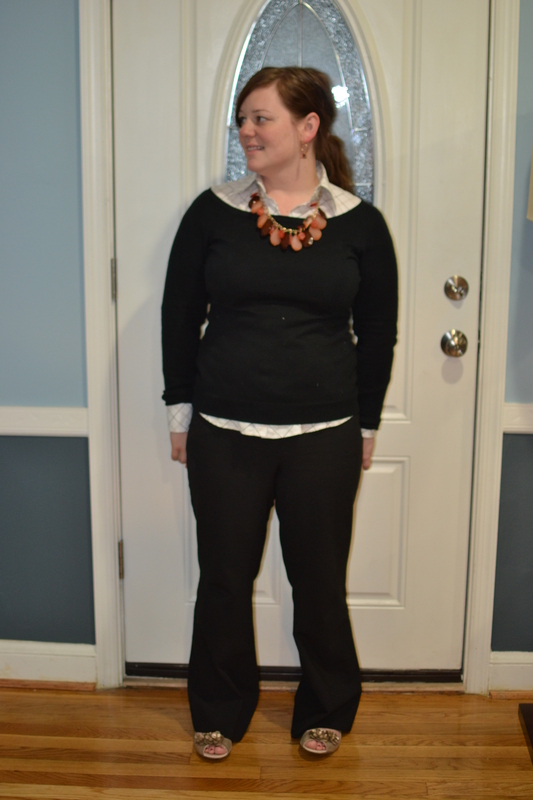 What I do really love is this sweater and statement necklace. 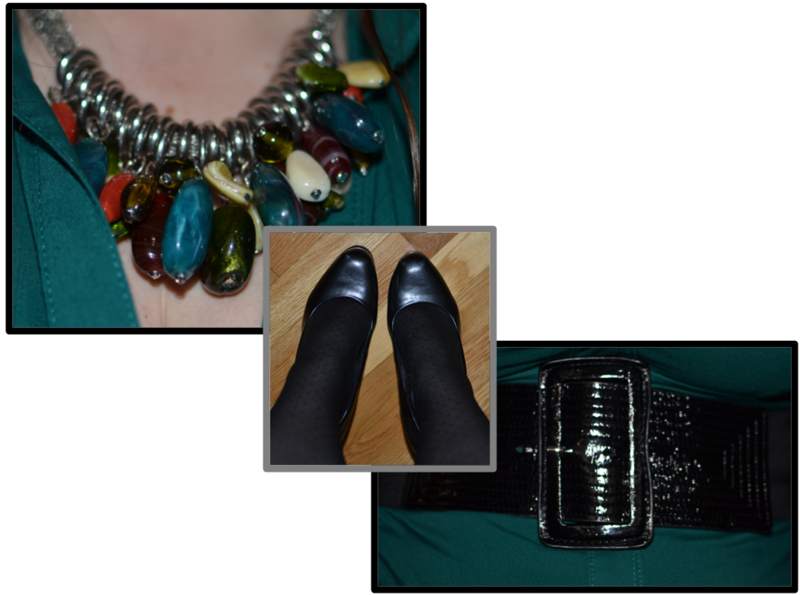 I don’t know that I love the button-up under it, but I do love the necklace with this. 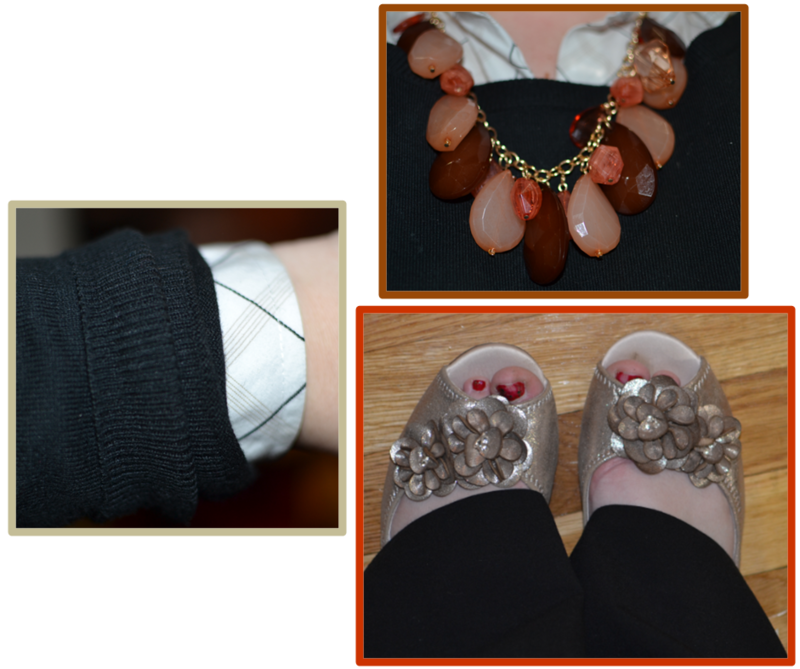 What do you wear when you are super tired and need to be put together? I would like to preface this with – I don’t think that these pants are 80’s-ish, but the Hubs does. 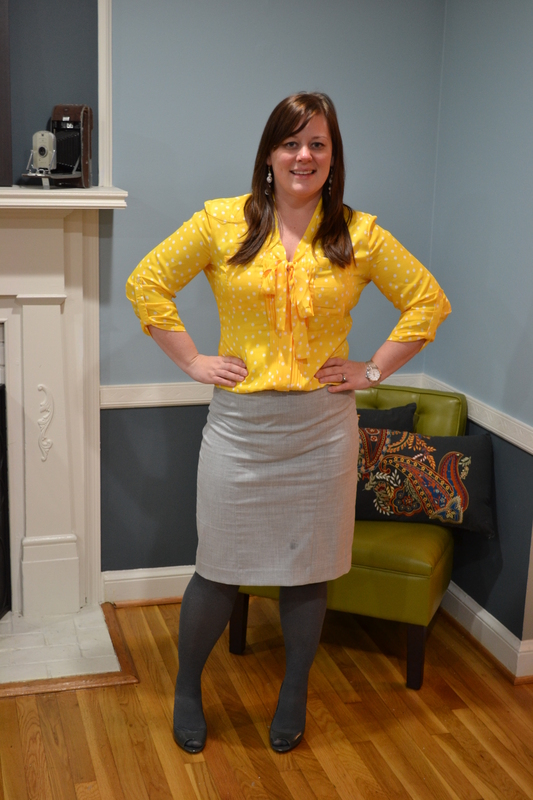 I have been wanting a mustard colored skirt and yesterday while running errands, we stopped by New York and Company. I really wanted their raspberry pink suit – but also tried on these pants. I liked them a lot and the Hubs thought that they were a little 80’s, so I thought that I would just wait until they went on sale. It turns out that it was buy one pair of pants and get another pair FREE! I also had a super coupon for spend $90 and save $40. So I ended up buying the pink suit and these pants (if you can call getting them free buying them). There are several other things that I also now have my eye on. 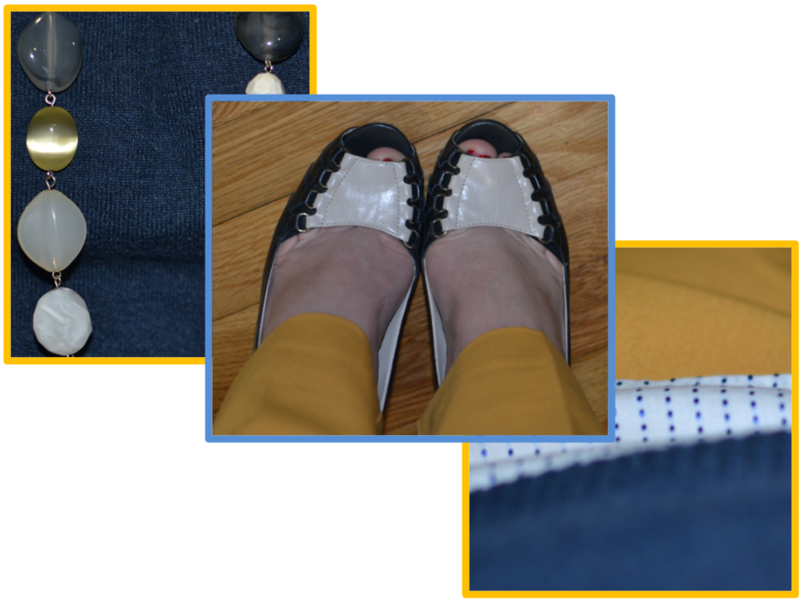 I am so excited about these pants that I have thought of at least 4 different ways that I can wear them. What do you think? Are the pants too 80’s? 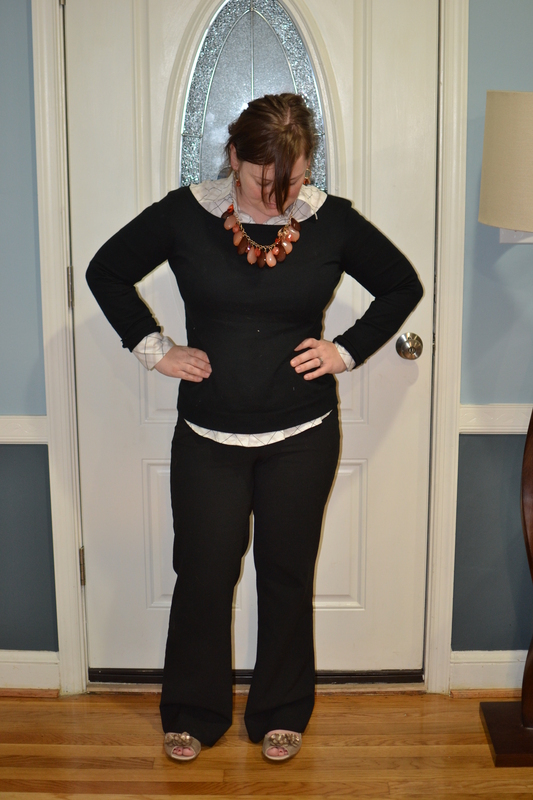 I also am loving an ankle pant with heels. I have about three or four other ankle pants on my wishlist. What do you think? Do you think that they are flattering at this length on me? So this is my first of 4 BOLD outfits this week. I think that will be my theme. I have also thought about what I am wearing for Find it Friday too! Yay for outfit planning. And now for the detail shot – Have a great day!! My inlaws were in town this weekend. We had a lot of fun relaxing. Friday night we went to dinner near by and just caught up. Saturday we played at the local park with the Bug and then the Hubs and I went on a date without the baby – dinner and a movie. The grandparents watched the baby and loved it! Sunday after church, we went to Co Co Sala for brunch. The chocolate was amazing and i cannot wait to go back with girlfriends. Today I had doctor’s appointments and errands to run after the inlaws left for Ohio. 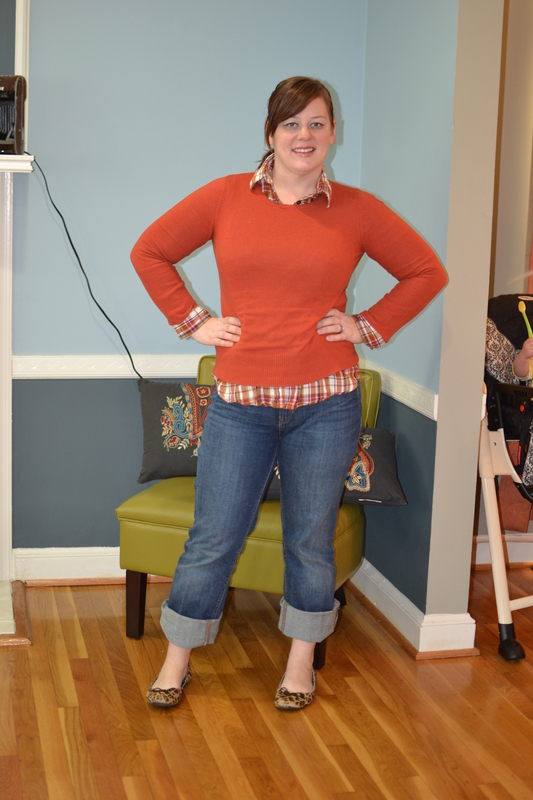 Here is a roundup of weekend outfits. I wore one other one – but the Bug got it very dirty and not picture worthy. It was a long week and it was nice to change into something very comfortable for dinner at the local diner. 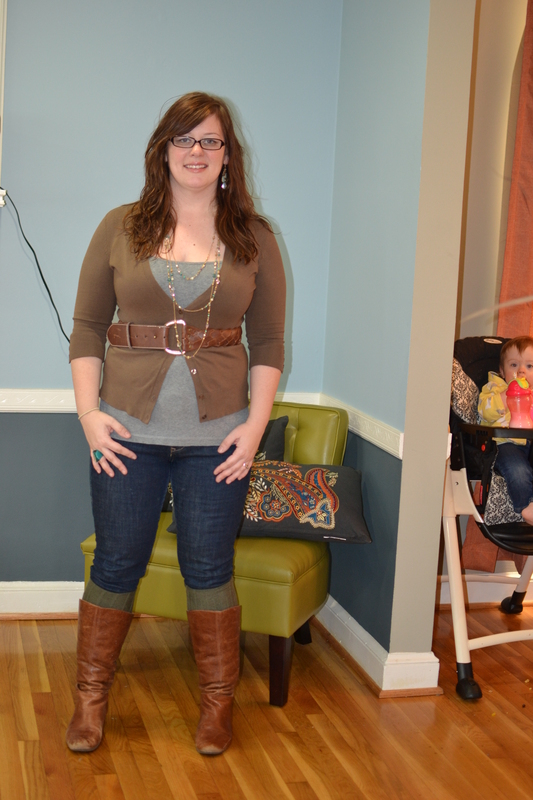 This was my park and date night outfit. Pretty casual – but we really just ate dinner at the mall and then went to a movie. 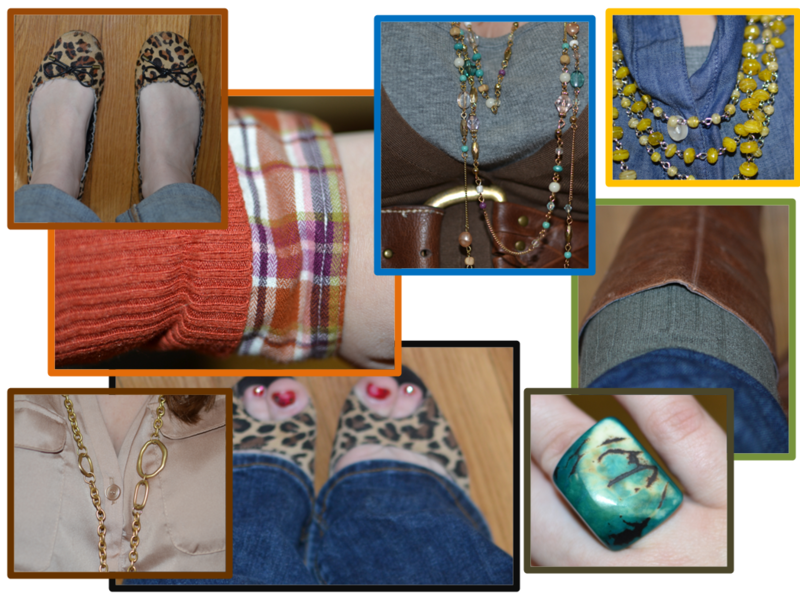 Shirt and Cardi – New York and Company, Jeans – Levis via TJ Maxx, Necklace – gift from MIL, Glasses – Calvin Klein (these are my old glasses… I can’t wait for my new ones to come in), Shoes – Candies via Kohls. I am so excited that the Hubs and I did a little bit of shopping when we were out running errands. I have some BOLD outfits coming this week. The detail shots are always fun to put together. You may have noticed that some pieces I wore over and over again. That happens on the weekends. I like to remix multiple days in a row. I also think that leopard should be considered a neutral. What do you think? I also found out that I can make my hair wavy. Naturally my hair is very straight -so to have a little waves is very exciting to me. What do you think? Do you like the waves? Yay for Taylor participating in Find it Friday! Click on the picture to see the post! I love the pattern mixing and that dress. 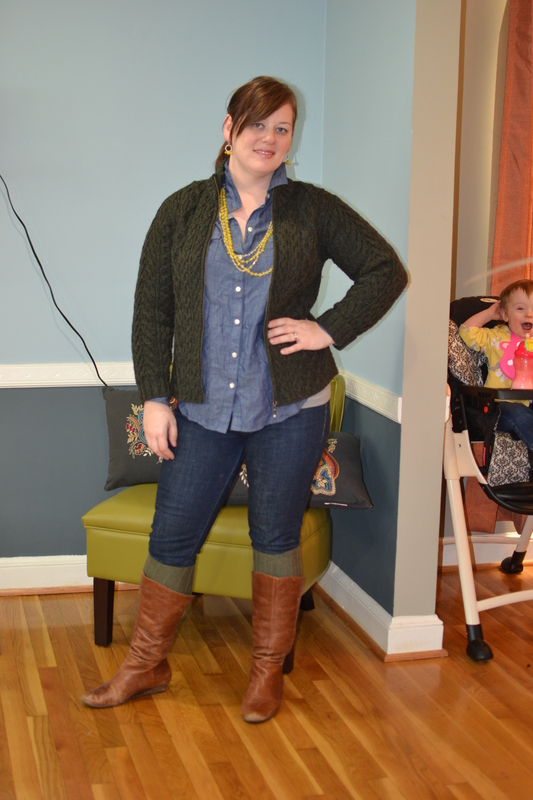 It is a great piece to pattern mix and also looks great with those boots. I want to steal her belt and her boots. I need black boots like that. 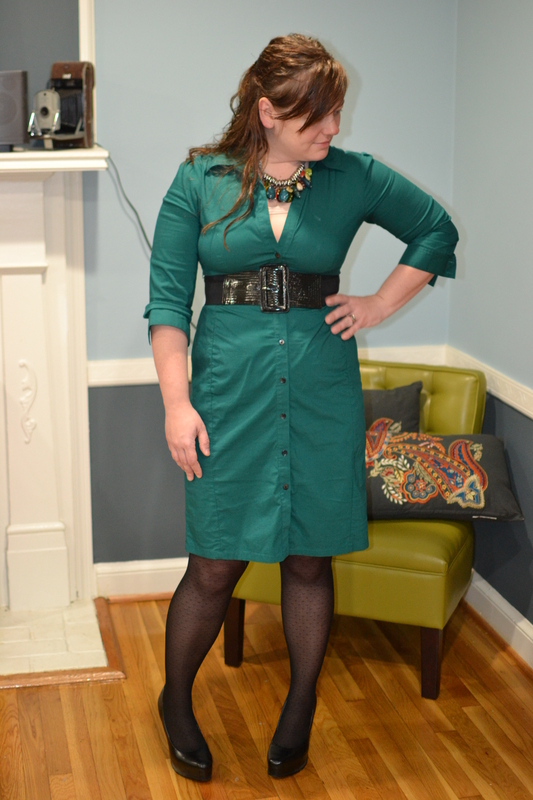 Again – here is my outfit. I love how both of our outfits turned out. Please join us next week on Friday!! Yay for Find it Friday! 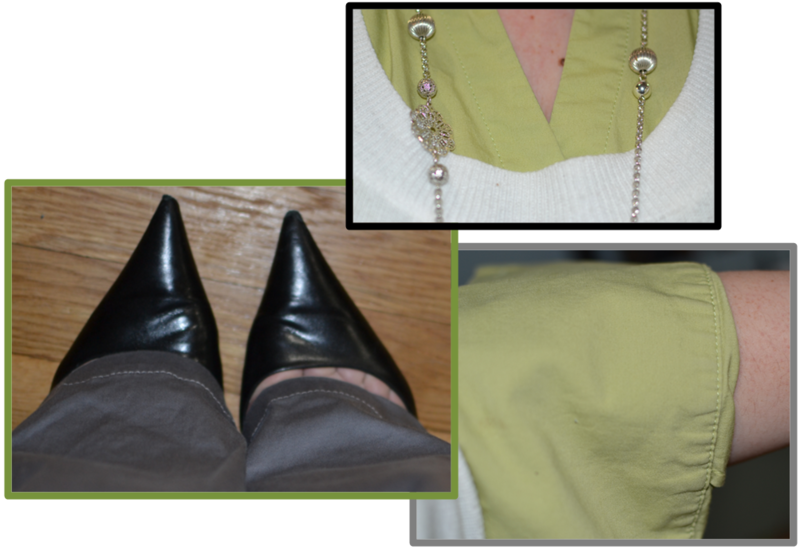 Find it Friday is when you FIND something in your closet that you haven’t worn in a long time and wear it on FRIDAY. Then you make up your mind if it still should belong in that closet of yours. Who wants to guess which item I “found” today?